It’s finally here. 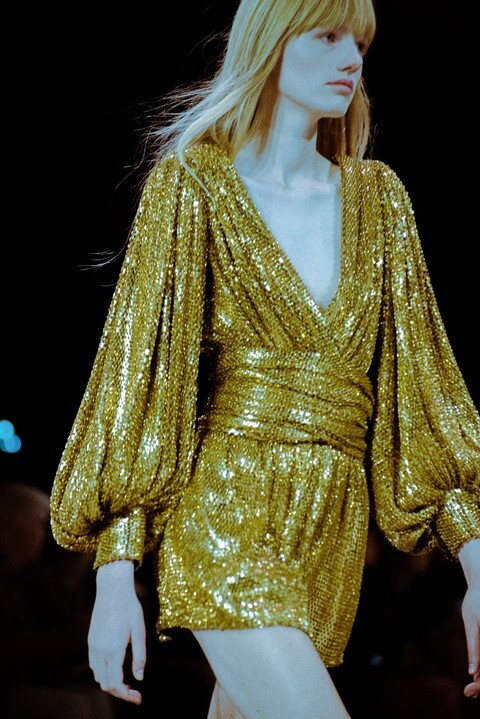 Tonight in Paris, Hedi Slimane debuted his anticipated first collection for Celine – with no é. Here’s what went down. The designer’s Saint Laurent mini editions have gone supersized, with guests receiving a linen-bound, Celine-emblazoned coffee table tome as an invitation. Inside was a series of photos of iconic Parisian nightlife venues, taken by, you guessed it, Hedi himself. A huge, very black rectangular show space was constructed at Les Invalides on the city’s left bank, just in front of the Dôme des Invalides, which Wikipedia helpfully tells us is Paris’s tallest church! Inside, guests included Karl Lagerfeld, Lady Gaga, and Virgil Abloh, while waiters served Celine branded champagne. The lights went down and a duo of drummers emerged at the mouth of the runway, dressed in their official uniforms. Then, a huge black box in the middle of the space shifted to reveal a totally mirrored interior, catching the light as it moved. The thumping soundtrack was provided by La Femme’s Marlon Magnee and Sacha Got with model Grace Hartzel, who could be spotted in the FROW bouncing along. Current Dazed cover star Hannah Motler opened the show in a black and white polka dot dress, which set the tone for a lot of the womenswear: this season, the Celine girls are headed to a party, wearing sequins, puffball skirts, and ruffled sparkly dresses, with leather jackets and oversized blazers thrown over their shoulders. Looks were finished with Parisian Bibi hats: a tribute to the nights Hedi spent clubbing at legendary nightclub La Palace and Les Bains Douche. As with the womenswear, just about all of the menswear looks were monochrome. Boxy, new wave style tailored jackets with patch pockets were paired with super skinny shirts and ties, and narrow trousers. Other boys wore long leather trenches over turtlenecks and drainpipe jeans, which, for the most part, were tucked into ankle boots, with most looks finished with classic black sunglasses. Don't think that this half of the collection is just for the boys, though: everything on the line-up is unisex and will come in women's sizes when it hits the stores next season. In the form of prints designed by Christian Marclay, the Swiss-American artist behind The Clock – the cult 24 hour long film that just returned to London. 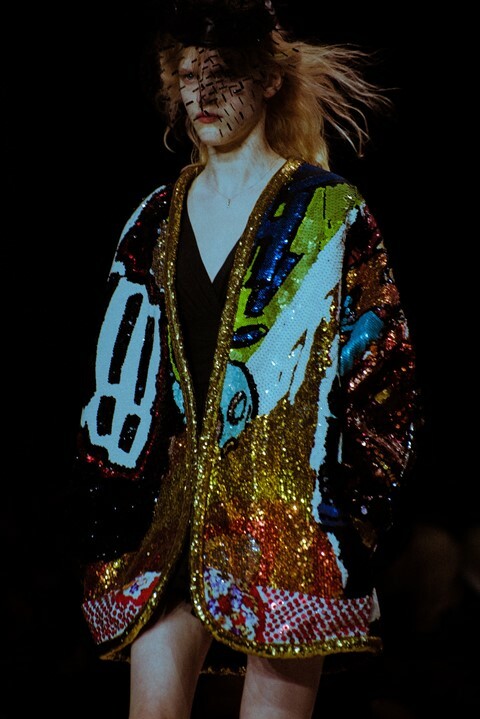 The artist’s work was seen in embroidered and sequinned Couture pieces, which brought flashes of colour to an otherwise monochromatic collection.